Start off your visit on the 1st (Mon): steep yourself in history at Abu Simbel Temple Complex. 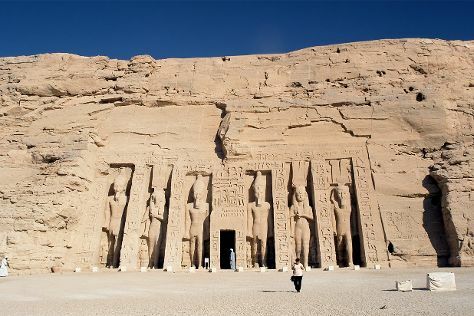 For maps, photos, where to stay, and other tourist information, go to the Abu Simbel day trip planning site . Cairo to Abu Simbel is an approximately 4.5-hour flight. You can also drive. Expect somewhat warmer weather when traveling from Cairo in July: highs in Abu Simbel hover around 47°C, while lows dip to 30°C. Wrap up your sightseeing on the 1st (Mon) early enough to travel to Aswan. 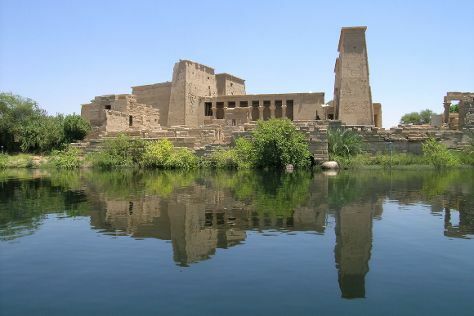 Do some cultural sightseeing at Philae Temple and Temple of Kom Ombo. Popular historic sites such as Nubian Village and New Kalabsha are in your itinerary. And it doesn't end there: examine the collection at Animalia, hunt for treasures at Aswan Market, delve into the distant past at Qubbet el-Hawa, and make a trip to Bent Pyramid. For where to stay, more things to do, reviews, and other tourist information, read Aswan trip itinerary maker tool . Do a combination of flight and taxi from Abu Simbel to Aswan in 1.5 hours. Alternatively, you can drive. In July in Aswan, expect temperatures between 49°C during the day and 32°C at night. Finish your sightseeing early on the 5th (Fri) to allow enough time to drive to Luxor. 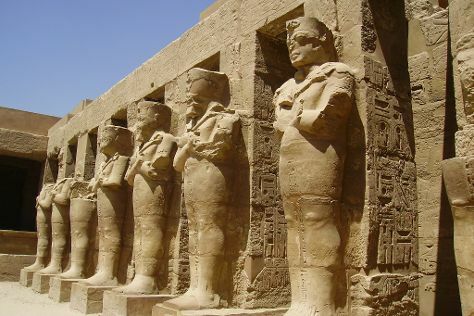 Luxor Museum and Karnak Open Air Museum will appeal to museum buffs. For shopping fun, head to Imhotep Alabaster Luxor or Abdin Art Gallery. Explore Luxor's surroundings by going to Edfu (Gibel Silsila, Temple of Horus at Edfu, & more). There's lots more to do: explore the ancient world of Temple of Karnak, appreciate the history behind Temple of Hatshepsut at Deir el Bahari, stroll the grounds of Valley of the Kings, and get to know the fascinating history of Avenue of Sphinxes. To see ratings, photos, other places to visit, and more tourist information, you can read our Luxor trip maker . Drive from Aswan to Luxor in 3.5 hours. Alternatively, you can take a train. July in Luxor sees daily highs of 48°C and lows of 30°C at night. Finish your sightseeing early on the 13th (Sat) so you can drive to Qena. Qena is a city in Upper Egypt, and the capital of the Qena Governorate. Kick off your visit on the 14th (Sun): explore the ancient world of Dendera Temple Complex, delve into the distant past at Temple Khatkhor, then explore the ancient world of Temple of Hathor at Dendera, and finally look for gifts at Kome el dabie Ancient Ferka textiles workshop. To find more things to do, other places to visit, photos, and tourist information, use the Qena online road trip planner . Traveling by car from Luxor to Qena takes 1.5 hours. In July in Qena, expect temperatures between 48°C during the day and 30°C at night. Wrap up your sightseeing on the 14th (Sun) early enough to drive to Marsa Alam. Your itinerary includes some good beach time at Sharm El Luli and El Qulan Mangrove Forest. Step out of the city life by going to Marsa Mubarak and Elphinstone Reef. There's much more to do: fulfill a lifelong dream with Seaworld Diving Center, don't miss a visit to Shaab Marsa Alam, take an in-depth tour of Astronomy Center, and tour the pleasant surroundings at Hankorab Beach. To find more things to do, where to stay, traveler tips, and more tourist information, go to the Marsa Alam online trip maker . Drive from Qena to Marsa Alam in 5 hours. Alternatively, you can take a bus; or do a combination of train and bus. Traveling from Qena in July, expect nights in Marsa Alam to be about the same, around 32°C, while days are slightly colder, around 41°C. Wrap up your sightseeing on the 21st (Sun) to allow time to drive to Hurghada. Get in touch with nature at Scuba & Snorkeling and Mahmya Island. Give yourself a bit of retail therapy at Senzo Mall and Sultan Center Shop. Spend the 23rd (Tue) in unforgettable company with a swim-with-the-dolphins experience. Spend the 28th (Sun) riding across the waves with a waterskiing or jet-skiing adventure. There's lots more to do: fly like a bird with a parasailing or paragliding tour, slough off your stress at Turkish baths, see the interesting displays at Selkhet Papyrus, and explore the gorgeous colors at Omo Gamaar. To find photos, reviews, where to stay, and more tourist information, go to the Hurghada trip planning website . Traveling by car from Marsa Alam to Hurghada takes 4 hours. Alternatively, you can do a combination of taxi and flight; or take a bus. Traveling from Marsa Alam in July, expect nights in Hurghada to be about the same, around 33°C, while days are somewhat warmer, around 45°C. Wrap up your sightseeing on the 29th (Mon) to allow time to travel to Sharm El Sheikh. Your inner history buff will appreciate The Heavenly Cathedral and Al Mustafa Mosque. Satisfy your inner culture vulture at Na'ama Bay and King Tut Museum. Spend the 30th (Tue) among aquatic life with a scuba or snorkeling tour. And it doesn't end there: buy something for everyone on your list at SOHO Square, look for all kinds of wild species at Wildlife Areas, kick back and relax at Mangrove Beach, and get outside with Bibo Viaggi. For maps, more things to do, reviews, and other tourist information, go to the Sharm El Sheikh travel itinerary planner. Do a combination of bus and flight from Hurghada to Sharm El Sheikh in 1.5 hours. Alternatively, you can ride a ferry; or drive. Expect a daytime high around 44°C in July, and nighttime lows around 34°C. Wrap up your sightseeing on the 6th (Tue) to allow time to drive to Dahab. Satisfy your inner culture vulture at Mount Sinai and St. Catherine's Monastery. Get some historical perspective at Salah El-Din Castle and St. Anthony's Monastery (Deir Mar Antonios). Spend the 7th (Wed) among aquatic life with a scuba or snorkeling tour. There's lots more to do: Head underground at Blue Hole, view the masterpieces at WICKEDiCANDY, see the vivid underwater world at Coral Reefs, and relax and rejuvenate at some of the best spas. For where to stay, photos, and tourist information, refer to the Dahab day trip planning site . Getting from Sharm El Sheikh to Dahab by car takes about 1.5 hours. Other options: take a bus. 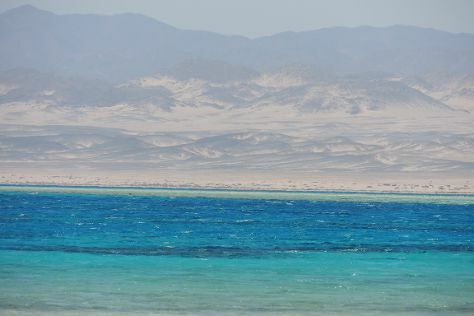 In August in Dahab, expect temperatures between 45°C during the day and 35°C at night. Finish up your sightseeing early on the 12th (Mon) so you can travel to Alexandria. Known for its turbulent and eventful past, the port city of Alexandria retains a historic charm and atmosphere, boasting thousands of years of Egypt's cultural heritage. Do your shopping at Alexandria Library and Bahgat Gallery. Your inner history buff will appreciate Fort Qaitbey and El Alamein War Cemetery. You'll find plenty of places to visit near Alexandria: Dahab reef (in Kawm ad Dahab) and El Alamein (El Alamein War Museum & Deutsche Kriegsgraeberstatte). 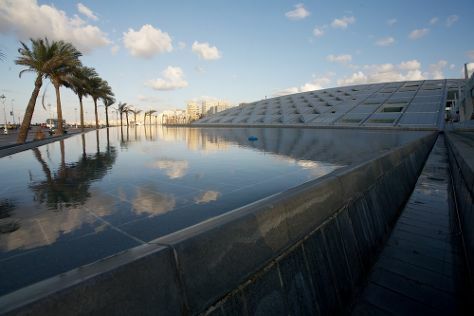 There's much more to do: admire the striking features of Bibliotheca Alexandrina, examine the collection at Royal Jewelry Museum, take an in-depth tour of El Kobba El Samaweya, and take in the exciting artwork at El Prince Serour. For traveler tips, ratings, where to stay, and tourist information, read our Alexandria travel planning website . Getting from Dahab to Alexandria by combination of bus and flight takes about 5.5 hours. Other options: do a combination of bus and flight; or drive. Plan for a bit cooler temperatures traveling from Dahab in August, with highs in Alexandria at 37°C and lows at 28°C. Finish your sightseeing early on the 19th (Mon) to allow enough time to take a bus to Mersa Matruh. Kick off your visit on the 20th (Tue): take a stroll around Marsa Matruh, look for gifts at Souq Libya, and then enjoy the sand and surf at Almaza Bay. To see photos, ratings, reviews, and more tourist information, read our Mersa Matruh online vacation planner . Traveling by bus from Alexandria to Mersa Matruh takes 3 hours. Alternatively, you can drive; or take a train. In August, daily temperatures in Mersa Matruh can reach 36°C, while at night they dip to 27°C. Finish your sightseeing early on the 20th (Tue) to allow enough time to take a bus to Cairo. Get a sense of the local culture at Egyptian Antiquities Museum and Saqqara (Sakkara) Pyramids. Escape the urban bustle at Zamalek (Gezira Island) and Nile River. Change things up with these side-trips from Cairo: Giza (Pyramids of Giza, Great Sphinx, & more). Spend the 29th (Thu) behind the viewfinder with an inspiring photography tour. And it doesn't end there: admire the striking features of Khan Al-Khalili, take a stroll through Old City (Coptic Cairo), take an in-depth tour of Egypt Travel Gate Day Tours, and browse the exhibits of Townhouse Gallery. To see other places to visit, where to stay, reviews, and other tourist information, refer to the Cairo trip maker app . Getting from Mersa Matruh to Cairo by bus takes about 5 hours. Other options: drive; or take a train. When traveling from Mersa Matruh in August, plan for a bit warmer days and about the same nights in Cairo: temperatures range from 41°C by day to 30°C at night. Finish your sightseeing early on the 29th (Thu) so you can travel back home.